Baked popcorn chicken is a weeknight dinner staple. The crunchiest chicken, using a perfectly salted potato chip crust! 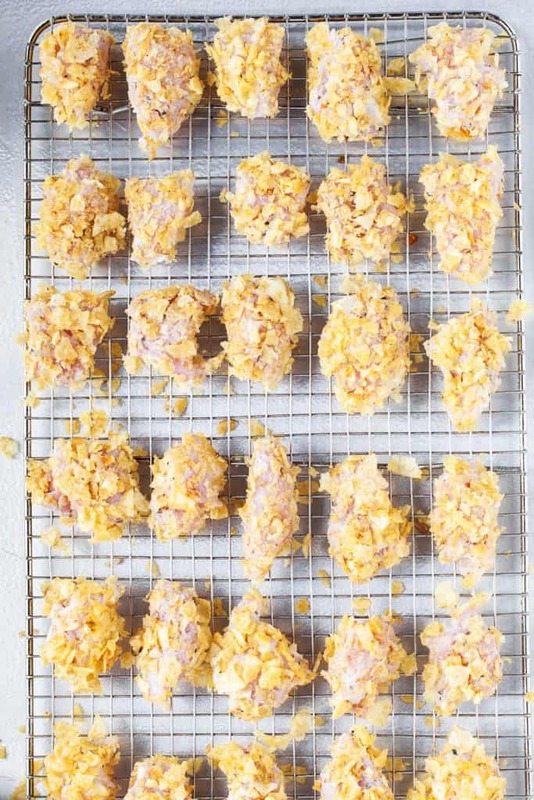 Do yourself a favor and make a quadruple batch of this Baked Popcorn Chicken. The first batch I made (with the recipe below) disappeared in 10 minutes! I suggest doubling the batch for your family and quadrupling the batch for larger gatherings. 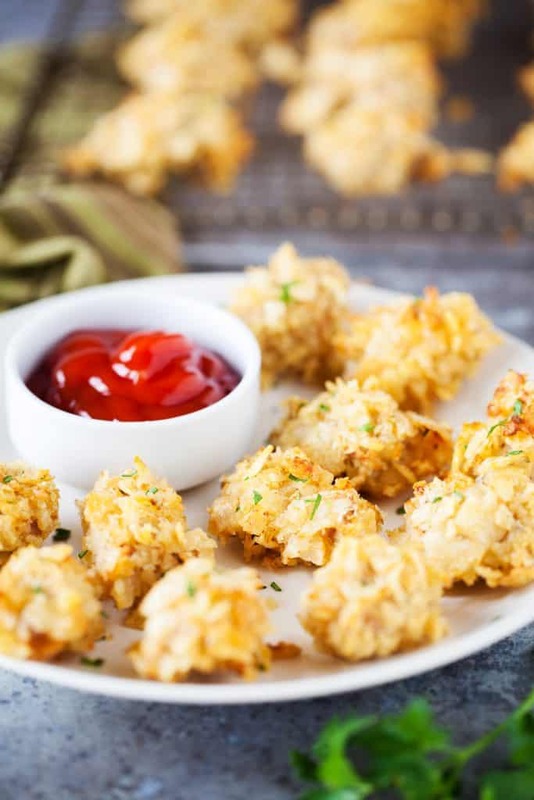 The crispy salty chips in combination with succulent chicken pieces make these Baked Popcorn Chicken completely addicting. 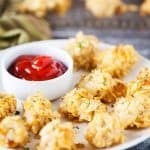 This popcorn chicken recipe is so completely versatile that you don’t have to make it the same way twice. Unless you have one of those “don’t mess with a good thing” people in your house. Because this is made with potato chips, there is really no wrong way to do it. With the ever-growing varieties of potato chips on the market these days, the options are endless. Doritos, Ranch, Cheddar, Vinegar, BBQ, and Sour Cream and Onion are some of our favorites. This is one of those recipes that you will be making again and again! I hope you love this Baked Popcorn Chicken as much as we do! 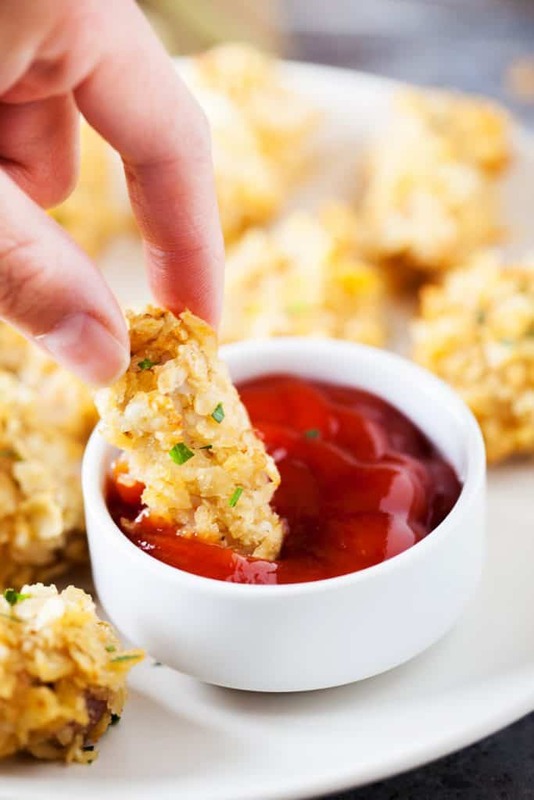 You will be hard pressed to find an easier baked popcorn chicken recipe. You will start with a medium bowl and combine buttermilk, garlic, parsley, basil, oregano, thyme, cayenne pepper, and black pepper. We like the flavor of garlic and the kick of cayenne pepper, but you can adjust the amounts to your liking for this recipe. Drop in the chicken (should be cut into 1-2 inch pieces), toss it all up and make sure that the chicken is coated on all sides. Pop that bowl in the fridge for 30 minutes to allow the seasonings to marinate into the chicken. Another method that I have used is to mix everything together inside of a large plastic bag. This is the cleaner method because you won’t need a bowl and you can just toss the bag when you are done! After the 30 minutes is up (and you can leave it in there longer! ), grab the chicken out of the fridge. Set up another bowl with the crushed chips. You can use whichever chips you like here, but whatever you decide, get them good and crushed. This will allow them to coat the chicken easier. Take each individual piece of chicken out of the bowl and dredge it generously through the chips. Place them on a greased baking sheet and pop them in the oven for 25 minutes. As far as the dipping options go, ketchup happens to be in abundance in our house so we tend to use it a lot. Ranch dressing is another great choice, but really it depends on what flavor of chip you go with. Looking for other Chicken Recipes? In a large bowl, add the buttermilk, garlic, parsley, basil, oregano, thyme, cayenne, and black pepper. Stir to combine. Add the chicken and marinate covered for 30 minutes. Preheat oven to 400°F and fit a cooling rack over a rimmed baking sheet. Spray rack with non-stick cooking spray. Pour the chips into a large bowl. Working in small batches, use a slotted spoon to remove the chicken from the buttermilk and dredge in the chips. Ensure each chicken pieces is thoroughly coated in the chips and transfer to the prepared rack. Repeat with the remaining chicken. Bake for 25 minutes, rotating the pan halfway through. Let cool for 20 minutes before serving. Serve with ketchup. Did you make Baked Popcorn Chicken? Did you make this recipe? I want to hear about it! Take a picture and tag me on Instagram or on Facebook. I would love to see your finished product! Make sure to tag me @iamhomesteader or hashtag #iamhomesteader, or both!